Additive Manufacturing to some – 3D Printing to the rest of us. Stereolithography or SLA, is a technology used for the 3D printing of models, prototypes and other three-dimensional products. It is also known as additive manufacturing because the production process involves adding layer upon layer of material with photopolymerization – the application of light to cause the layers of materials to link creating a solid, three-dimensional form. Research in this area began in the 1970s, and a patent on the process was granted to Chuck Hall in 1984. While the early years of 3D printing were grounded in science and technology (and of no real interest or usefulness to the average person), the evolution of the process has changed the 3D printing landscape, making it into a more creative application. Today, 3D printing is not only more readily accessible to the average person – it can also be great fun. In recent years SLA has evolved so that many different types of materials can be used in 3D printing. For example, SLA is commonly used in the medical field for making plastic molds for hearing aids, for building a custom fit ceramic crown in a dental office, or for anatomical models to be used by doctors for preoperative planning. The company Invisalign© has been using the technology for years to custom mold retainers. Similarly, other companies use SLA to create three-dimensional bone-replacement devices uniquely measured for a specific patient. Likewise, automobile manufacturers can print replacement parts for cars as needed whether it is made from rubber, plastic or metal. In fact, designer, Petr Chladek built an entire car through the use of 3D printing. His “4ekolka” all-electric car is not only lightweight but more economical. The 4ekolka is an all-electric car made entirely through the use of 3D printing. 3D printing can be used for elements of a car’s bodywork to allow for custom designs and customer personalization such as in the form of a 3D thermoplastic skin. The advantages of SLA include the ability to produce products, as needed, reducing the need for storage space. Also, there is less waste. Any material not used in the product can be reused. With 3D printers becoming more locally available it is now easier than ever to have something printed locally versus having a product shipped to you. However, more technical 3D printing projects may require a CAD based software program to design instructions for the printer. For the rest of us, there are simple 3D design apps drawing the schematics for the product we design—which we can then print ourselves with a relatively inexpensive home printer—or sent to a 3D printing company such as Shapeways. As the scope of materials used in 3D printing has expanded, and the printers themselves have evolved to manage more complicated printing projects, SLA has evolved into an artform – literally. Printers can use gold, silver, sandstone, acrylics, wax—even food products such as sugar and fresh ingredients—to create three-dimensional products including jewelry, shoes, clothing, and artwork. Even the “wings” the Victoria’s Secret models use in their fashion shows are 3D printed. Adidas is launching its Futurecraft 4D shoe. 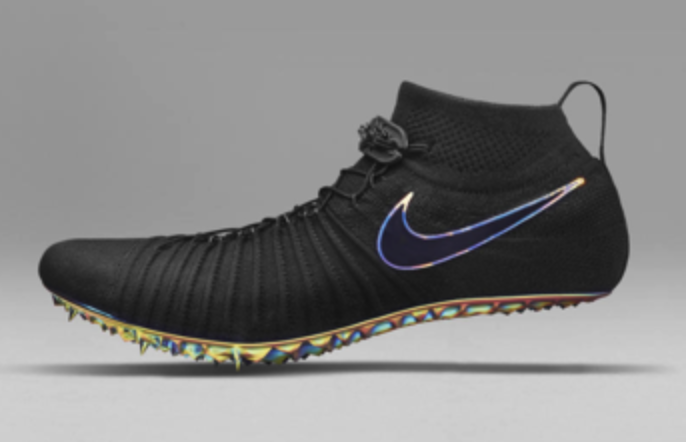 Racing to compete in the 3D market, Nike is launching its Zoom Vaporfly Elite Flyprint. Designer Katrien Herdewyn has designed 3D printed high heels. Paris Fashion Week presents 3D printed clothing (left). And a Victoria’s Secret Model wearing 3D printed lingerie (right). SLA has even made its way to food. These are examples of using sugar and water compounds for 3D printed cakes. SLA has an application in the games and entertainment industries such as a guitar, and chess. BUT WAIT: Is your fun or hobby breaking the law? SLA can appeal to scientists and artists, foodies and fashionistas. The attraction to 3D printing may be the intricacy of writing computer code for 3D artwork or the excitement of seeing your design grow layer by layer into a tangible three-dimensional form. A 3D printed product can be unique and complex, or simple and easily mass-produced. Children love having their faces printed on the three-dimensional image of their favorite Disney ® character. Or Star Wars® fans might want their image printed onto a model of a Storm Trooper®. But whenever we come up with great creative ideas and different ways to express ourselves, the creativity police – commonly known as Intellectual Property Lawyers – are always hovering in the background ready to dampen our fun. And for good reason. Intellectual property laws are designed to help protect our creations. Three-dimensional models can be protected by copyright law, which gives the designer the exclusive right to reproduce and sell his design. Similarly, trademark law protects trademarks or brands such as Disney ®, Nike ® and others from being imprinted on unauthorized products. The technology behind the SLA printers themselves may be protected by patent law. And the code used to program a printer may be protected by trade secret law. Technology is always attractive to infringers – those wanting to make easy money by copying other peoples’ ideas. SLA is a particularly attractive target for infringers as the cost to set up business is becoming more affordable. 3D printing requires only a small space for a printer versus a larger manufacturing plant and warehouse. Plus, today’s smaller printers are more mobile and can easily be moved between locations to avoid detection. SLA does not need the shipping and distribution channels that typical product manufacturing require. The program codes, design graphics, and other schematics can be readily sent over the Internet to a local 3D printing service for in-person pick up, or for delivery service. The intellectual property owner’s ability to control their products’ creation and distribution can be difficult. Particularly when the cyber-technological nature of SLA means the orders and sales of SLA products can traverse international borders, or can be communicated between computer devices –virtually undetected. Where ordinarily imported goods would be monitored by U.S. Border and Customs Protection to ensure goods coming into the U.S. are authentic and not counterfeit, that gatekeeping step might be erased when using SLA. A recent study estimates the global loss of revenue to intellectual property owners in 2018 alone through the use of SLA will be around one hundred billion dollars. An important concern is that the cyber-technological nature of SLA may make it easily accessible to hackers. Illegally altered SLA files can result in the manufacture of abnormal 3D images including malformed medical implants, or imperfectly manufactured automotive parts that could cause physical harm if used. Using cybersecurity to protect SLA is more important than ever—not only in the manufacturing environment—but also for general business and home use of 3D printing. Creators should identify the work they consider proprietary; that they wouldn’t want anyone else to steal from them; and use intellectual property laws to protect those rights against infringers. Sellers should know the provenance of the product they are selling: Who manufactured it? Was the manufacturer authorized to manufacture it? Is the seller making accurate representations about the product he is selling – is it really an authentic automotive part? Buyers must be diligent about vetting the products they buy. Is the model an authentic Disney ® princess or a cheap knockoff? As we acknowledge World Intellectual Property Day on April 26, 2018, let us all admire and respect the creative processes of others. If you should have questions or need legal assistance with your intellectual property, contact Laraine Burrell directly and read up on all the latest IP topics on the JDSA Blog.